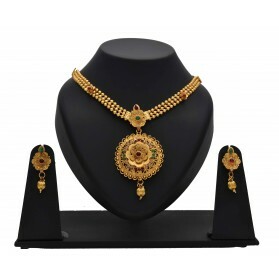 Kollam Supreme South Indian traditional gold plated bridal jewellery set. This wedding set contains two long necklaces, one Medium Pendant set and one choker necklace. All these Lakshmi Mangamala, Pichimottu Mala, Palakka mala and Nagapadathali are classic designs which are favourite among Kerala Hindu Brides. 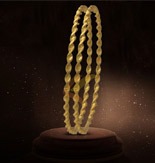 This classic, as well as trendy one gram gold Nagapadam Long Mala, is traditional South Indian Kerala bridal Jewelry. 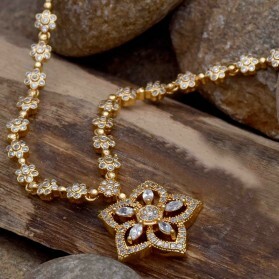 Floral Nagapadam motifs beautifully attached together to make this long chain. It is suitable for women on any occasions like Marriages and engagements. 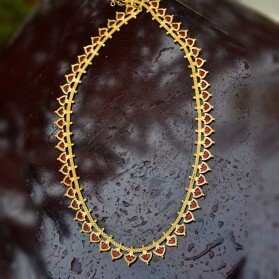 This beautiful Red Mango Long Chain is traditional and ethnic South Indian, Kerala Jewelry. Red mango charms beautifully adorned with white stones. It is suitable for women on any occasions like Marriages and engagements. Also worn by classical dancers. This beautiful one gram gold Blue Mango Long Chain (Manga Mala) is traditional and ethnic South Indian, Kerala Jewelry. Blue Mango beads beautifully arranged along with white stones.It is suitable for women on any occasions like Marriages and engagements. Also worn by classical dancers. This one gram gold classic Green Nagapadam Long Chain / Haram is traditional South Indian Kerala Jewelry. Classic green Nagapadam mala is adorned with Magenta stones. It is suitable for women on any occasions like Marriages, engagements and for classical dances. This beautiful Green Palakka Long Chain is traditional and ethnic South Indian, Kerala bridal Jewelry. Green Palakka charms beautifully arranged along with golden flowers. It is suitable for women on any occasions like Marriages and engagements. Also worn by classical dancers. This classic Blue Palakka model Long Mala is traditional South Indian, Kerala Jewelry which is known as "Pulinaga Haram". 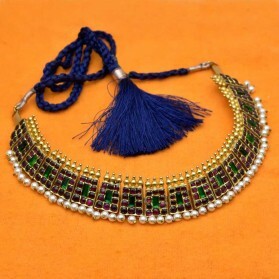 In a designer flat chain Blue Claw motifs beautifully arranged with a round Blue Pendant. It is suitable for women on any occasions like Marriages and engagements. This beautiful Palakka Long Chain is traditional and ethnic South Indian, Kerala bridal Jewelry. Palakka beads beautifully arranged on the one side of a long chain and which is designed with stones. The traditional small round Pendant has golden hangings and stone works. It is suitable for women on any occasions like Marriages and engagements. This classic Nagapadam model Long Mala is traditional South Indian Kerala Jewelry. 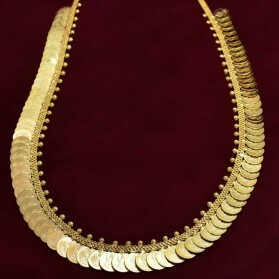 In a designer flat chain Nagapadam motifs beautifully arranged on the one side and stones on another side. It is suitable for women on any occasions like Marriages and engagements. This beautiful Green Mango Long Chain (Manga Mala) is traditional and ethnic South Indian, Kerala Jewelry. Green Mango beads beautifully arranged along with golden flowers and magenta stones.It is suitable for women on any occasions like Marriages and engagements. Also worn by classical dancers.